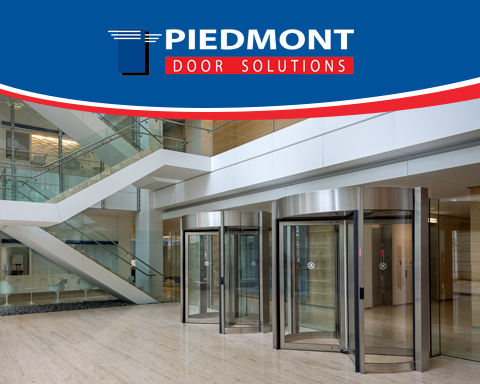 At Piedmont Door Solutions, we know your entrance is more than just a means for people to enter & exit your facility. It’s the first thing they’ll interact with when entering and the last when leaving- what else is guaranteed to be used twice by every customer, client and/or employee? You don’t get a second chance to make a first AND last impression-this is why your entrance is our priority! We pride ourselves in unmatched customer service, passion for detail and catering our offering to YOUR needs. Our industry is not a “one size fits all”, therefore our broad product and service offering allows us to be your one source solution. For over 15 years, this has been our focus and today we feel we’re the most trusted and respected provider in the markets we serve. Starting in Charlotte in 2001, today we’ve grown to six operations covering most of the Southeast with offices in Charlotte, NC- Greensboro, NC- Raleigh, NC – Columbia, SC- Birmingham, AL & Atlanta, Ga. We’re proud of the relationships we’ve developed with our customers and suppliers and look forward to the opportunity to serve you.